You’d think it was something of a tradition round ours – going out for a meal on Fathers Day. Last year we ended up at Bareñdoe by accident rather than design. This year, we ended up going out because we were too lazy to do anything at home. The person I’d spoken to on the phone was very pleasant and it was lovely to turn up and have our table ready to go, complete with requested high chair. We ate in the Bistro, but the Warradale does have other dining options (the Tavern and Garden/Verandah Bars both have separate menus on the website). Décor wise, the Bistro is very Adelaide modern pub although it does have some distinctive black and white angular mural decoration with a kitchen theme. As it was the very start of service, the staff were all fresh, efficient and friendly. The friendliness seemed genuine, too. Andy was even wished a happy fathers day! The menu is reasonably stock standard pub stuff – all the pub standards are there as well as the dishes that are fast becoming the new standards (salt and pepper squid, pasta with a prawn or crab and chilli sauce). Daily specials are written up on butcher paper at either end of the large dining room, but if you haven’t spotted them the staff should bring them to your attention. At least, our waitress did. The salad bar is included with the meals (and the waitress made sure to point out that we just needed to take our side plates up – I like that, too often you’re left wondering if the salad bar is included) and it’s a cut above. Quinoa, cranberry and pistachio salad, anyone? There’s good fat black olives, some really smooth feta, a range of salads and sauces and hot vegetables that don’t look like they’ve spent all day having all the goodness boiled out of them. With an utter lack of imagination we ordered schnitzels. Chicken parmi for me, beef with gravy for Andy. 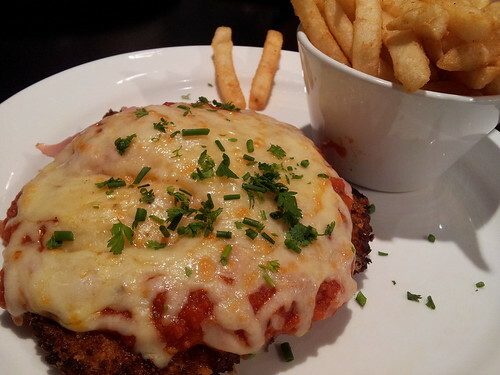 Schnitzels are $19 each, and that includes the basic sauces, but you’ll add $2.50 for parmigiana. Main courses mostly sit in the $20-30 price bracket. The schnitzels were actually pretty good – they had a really crispy, coarse crumb which stayed quite crunchy even under the toppings or gravy. Neither schnitzel was dry and the Parmigiana topping was tomato, ham and cheese with a very generous layer of ham. The wine (and beer) list is actually reasonable – shock horror! There’s a selection of craft beers, five ciders and the number and range of wines available by the glass is impressive. There’s a good range of premium spirits too – if you want to wrap up with an Armagnac you can indeed do that. The Warradale is offering standard pub grub in a standard renovated pub setting. While the salad bar and beverages list get a tick, my usual complaint applies: at just $21.50 the Parmigiana is just too pricy.